LOS ANGELES, California — All things come to those who wait, as Mitchell Frank can attest. Owner of the newly revived Regent Theater in downtown Los Angeles, it took Frank almost 10 years of dreaming about it, acquiring a long-term lease for it in February 2012, then waiting through 19 months of construction before the Regent finally reopened last November as a premier venue in LA’s reemerging downtown music scene. 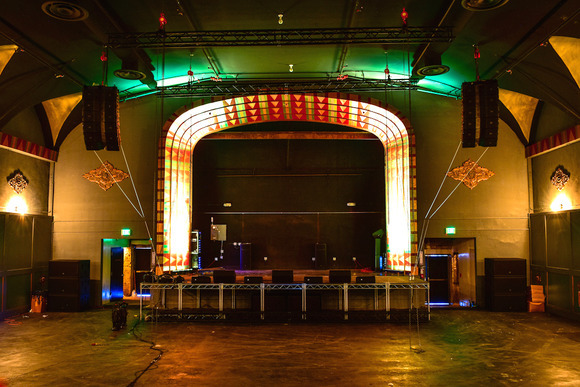 Originally built in the 1920s, the 1,100-capacity venue has been renovated with an eclectic combination of preserved historic architectural details and up to the minute furnishings and amenities – including a HARMAN Professional audio system based around JBL VTX Series line arrays and Crown I-Tech HD Series amplifiers. The Regent Theater’s VTX complement includes six V20 line array elements and four STX 828S dual-18-inch subwoofers on each side of the stage, augmented by four JBL AC26 2-way compact speakers for front fill, two PRX735 3-way full-range speakers used as side fills and an even dozen VRX915M 2-way 15-inch stage monitors. Six Crown I-Tech 4x3500HD amplifiers power the main left/right line arrays, three Crown I-Tech 12000HD amps drive the subwoofers and four I-Tech 4x3500HD amps handle the stage monitors. The Regent has a main floor that slopes to the stage and a newly built second-floor mezzanine level and Frank finds the VTX arrays deliver wide, even, controlled coverage to both levels. “The VTX line arrays are relatively compact, but really powerful and clean and it’s amazing how much space they can cover, and do it so well. We did not have to install separate speakers for the mezzanine.” Frank notes the Regent hosts an eclectic variety of music and the speakers, subs and amps can go from pounding yet completely undistorted deep bass on the venue’s dance music nights a to delicate, nuanced and sonically layered ‘high-fidelity’ presentation for acoustic-based acts.